Most COSCA trails and open space areas are open at this time. Please stay away from the closed areas until they are officially opened for use. 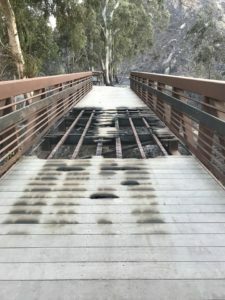 The Hill Canyon Bridge after the November 2018 Hill Fire. Scroll down to see the most recent updates of open and closed trails. Over 5000 acres of COSCA open space have burned. The rangers have addressed most of the extensive damage to the open spaces and trails. You must stay on established trails, no cutting across burned areas because that damages the new growth. This is also for your safety – there are soft spots where shrubs and trees have burned out, and other possible hazards. Use caution when on the trails, adjacent soils are loose, there are areas that may have slough and rocks. The Rangers will be out making sure everyone stays on the trails. Many oak trees have burned and fallen across the trails, or dropped limbs, or are in a precarious situation and could fall over at any time. The rangers have addressed those that are in areas that are now open. Please respect open space closures. As more areas open, we will post news at our Facebook page and here on this website. We are committed to working with COSCA in every possible way. There will be a need for volunteer and financial support for restoration. Please consider making a donation today. The COSCA home page is a good source for updates on the status of open space closures. 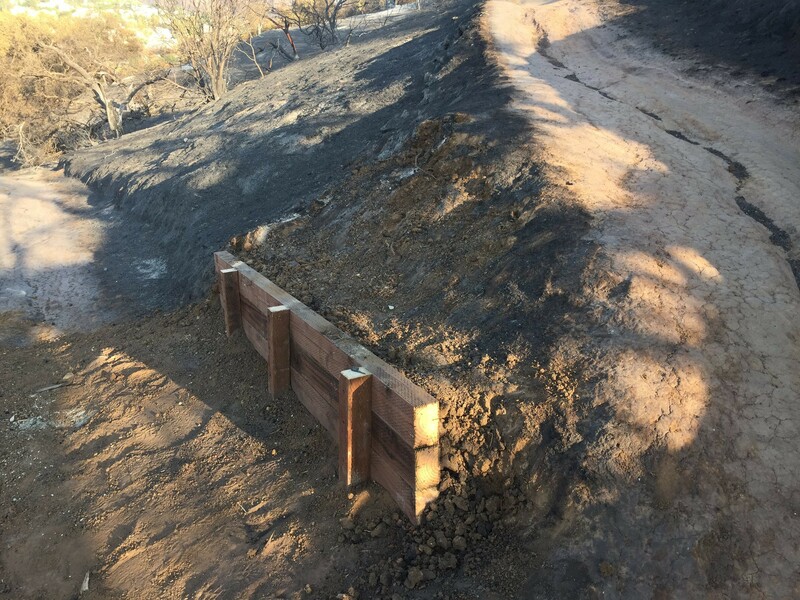 Here are before and after pictures of a retaining wall in Lang Ranch area that was rebuilt after the fire. The Rangers and the C.R.E.W. have been working hard to get as much Open Space Open as possible. Trees are still being evaluated and there are still some utilities being replaced. Thank you for your patience. March 4, 2019: There have been no new trail openings since the Dec 1 report. December 1, 2018: With the exception of the following, all trails are now open! November 17, 2018: Except for some trails with ‘Closed’ signs, Wildwood Open Space is open for use. Other areas listed below are still closed. These areas are now open for use: Los Robles, Rancho Potrero, Dos Vientos and Tarantula Hill Open Space areas. 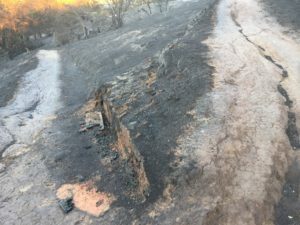 These areas are closed until further notice: Hill Canyon, Western Plateau, Conejo Canyons open space areas; Lang Ranch, Woodridge, Oakbrook open space areas; Hillcrest Open Space; North Ranch Open Space. November 14, 2018: All open spaces areas and trails are closed. Over 5000 acres of COSCA open space have burned. The rangers will be focusing their efforts on assessing and addressing damage to the open spaces and trails. Many oak trees have burned and fallen across the trails, or dropped limbs, or are in a precarious situation and could fall over at any time. During this period, the rangers may not be able to respond to requests for help, so all open space areas and trails are closed for the safety of the public. Closures will be reviewed and lifted as appropriate.